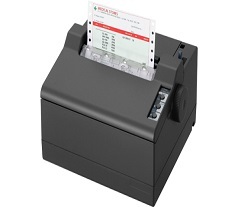 LQ-50 - Compact, versatile bill printer! LQ-50 from Epson is a compact, versatile bill printer with flexible wide receipt print options. In addition, it is designed to perform well in dusty or sandy locations. It supports 152.4mm (6") width fanfold paper for the issuing of receipts. Roll paper can also be used if the optional roll paper holder is attached to the printer. At only 275mm (10.83") wide, it is compactly designed to allow easy installation even on counters with limited space. Its 24-pin print head supports printing of Indian texts in high resolution both by the command control and through a Windows® driver. 10 local Indian language device fonts are pre-installed.